Home is where the heart is, the old saying goes. The newest holiday CD from New Prague's O'Neill Brothers was created to evoke the comfort, familiarity and heart-warming memories of home -- while raising money for an organization that helps put a roof over people's heads. Tim and Ryan O'Neill have released Holiday Home, their fourth album of instrumental holiday music, just in time for Christmas 2006. To celebrate the release of Holiday Home, The O'Neill Brothers are embarking on a very special partnership with Twin Cities Habitat for Humanity. Now through December 31, 2007, the brothers will donate $1 from the sale of every copy of Holiday Home to the organization. They will also headline a Habitat for Humanity volunteer recognition concert this holiday season at Orchestra Hall in Minneapolis. The concert will feature songs from the new CD, as well as favorites from their previous holiday releases, including Spirit of the Season: Vol. 1, Spirit of the Season: Vol. 2 and Coming Home. 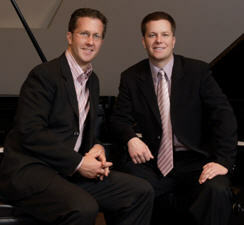 They will also perform a holiday concert in New Prague on November 29. To kick off the partnership, The O'Neill Brothers and their office staff volunteered at the Habitat for Humanity home being built in New Prague on Wednesday, November 15. This holiday season, 620 families will enjoy safe, decent and affordable housing - a place to call home - due to the valuable support that Twin Cities Habitat for Humanity has received over the years from volunteers, sponsors and community leaders.